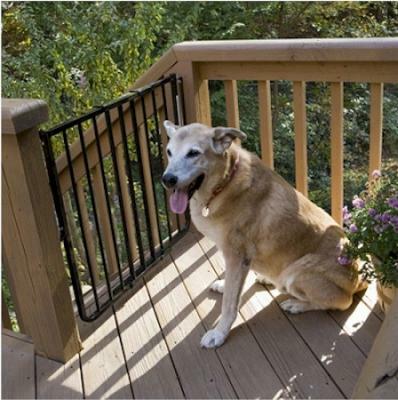 • Width is adjustable 27" to 42 1/2"
• Bar Spacing 2 1/2"
• 10 1/2 available for openings 42 1/4" to 53"
• 21 3/4 available for openings 42 1/2" to 64"
• Available in White, Black, and Brown The Stairway Special Outdoor Pet Gate is our maximum safety gate. Great for decks! 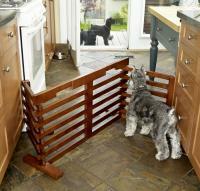 No other pet gate works as well for outdoor use. This pet gate is constructed of aluminum which is lighter weight than steel and has all stainless steel hardware - no plastic parts. It's rustproof! Designed for the top of a stairway but great for all areas. 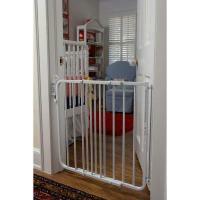 Features include a latch system that baffles toddlers yet allows one hand operation for adults, and an optional stop bracket prevents opening over a stairway for greater safety. 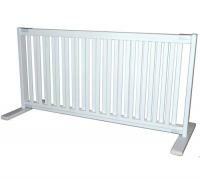 The Stairway Special Outdoor Gate will mount at angles up to 30 degrees. 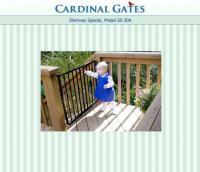 A powder-coated finish provides a long lasting, easy-to-clean surface and is available in White, Black, and Brown. 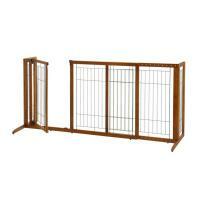 Richell Convertible Elite Pet Gate 6 Panel Black 197.5" x 0.8" x 31.5"